For personal reason, I limit the size of my thumb drives to 32GB. Many of my memory cards and USB flash drives are 8GB and 16GB in size. But for large scale storage, for the same price, I'd prefer solid state flash drives to traditional hard disks. 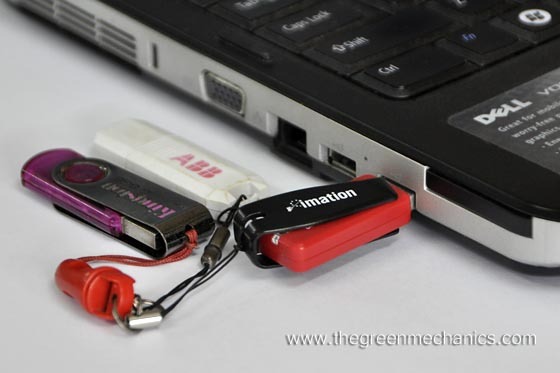 USB flash drives: Do you keep few in a bundle, or just one but with bigger capacity? How does a memory stick/ flashdrive work? In simple term: The chip inside contains a grid of transistors acting like tiny switches. All data is reduced to binary 1s and 0s and one of these values is stored at each point in the memory. To store a '1', the transistor in the relevant location is switched on, allowing charge to flow through it. The transistors stay in their ON or OFF states even with no power, so the data stays intact even when you disconnect your memory stick. In theory, there is no upper limit. FOREMAY Green Technology unveiled what it called the first 2TB (2,000 GB) solid state drive in standard 2.5" SATA form factor in January this year. During the CES in Las Vegas this year, Kingston unveiled its 1TB (1,000 GB) USB flash drive called the Kingston DataTraveler HyperX Predator 3.0, so, there's actually no stopping us from developing bigger thumb drives. Drive capacity, like every other aspect of computer technology will continue to increase and we are now almost at the point where solid-state flash drives outperform traditional hard disks. The only obstacle price. There is no news on how much Kingston's 1TB USB drive will cost but its current 512GB version is available at $1,750 (approx RM5,350). Now, would you be comfortable sticking a RM5,000 USB thumb drive on a RM2,799 laptop? I have a 16GB one to store newly taken photos just incase anything bad happen to my laptop. 1000GB flash drive? Wow, I wouldn't get myself a 1000GB thumb drive but I may consider if it's an SSD.